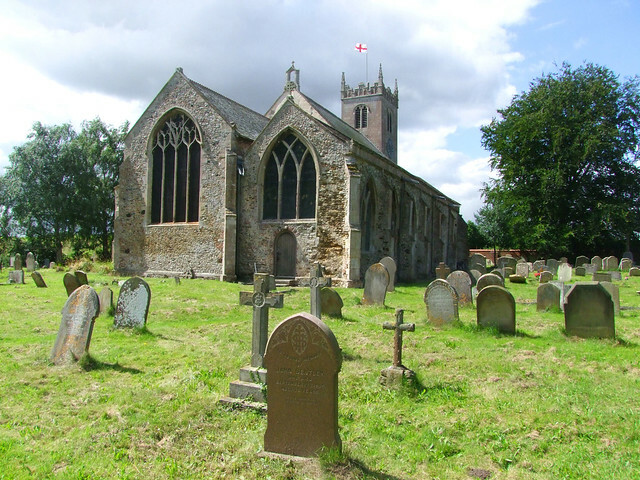 The setting of this beautiful church is quite different from that of its near neighbours Wiggenhall St Mary and Wiggenhall St Peter, for here the starkness of the fens is softened by a pretty village, the pub standing to the north of the church and a village square with a shop and old houses beyond that. The proximity of the church to the river is again disguised by the levee banks built up to protect the land now that the river level is so much higher than that of the country through which it rolls. Even so, several of the houses have markers to show how high the floods have come, higher than I am as recently as 1953. 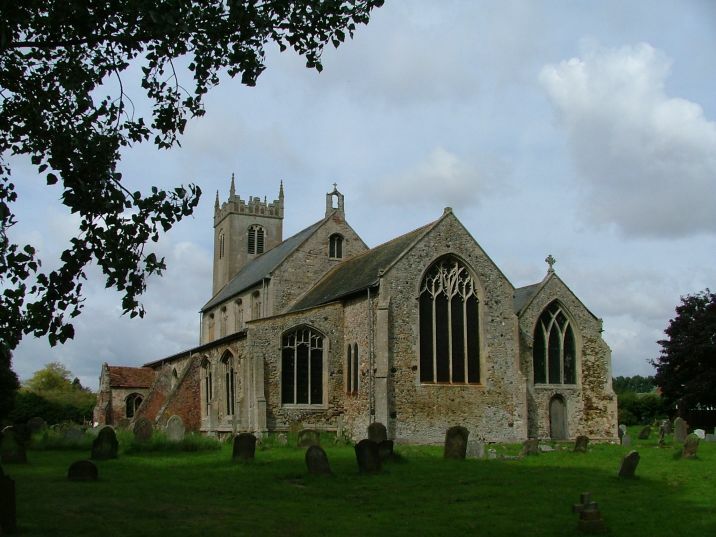 In many ways, St Germain is a typical East Anglian church with aisles, a clerestory and an earlier tower; the tower would be quite insignificant if it wasn't for the most elegant top stage with battlements and enchanting spires like a fairy castle. 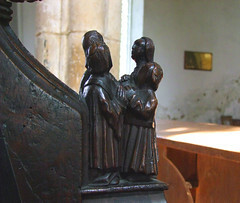 These are echoed by the sanctus bell turret at the other end of the nave. The aisles extend into the chancel, and that to the north has a gabled roof, culminating at the east end in a cross on the top. The view of St Germain from the east is very pleasing. This church is as feminine as St Mary is masculine, but she is a rather shabby old lady, propped up by large 18th century buttresses on the south side, and the red brick Tudor south porch crumbling to ruin. When I first came here in 2005 I think this is the first church I had ever entered from the east end. This is because the most easterly bay of the north chancel aisle was a vestry, and if you got the key it let you in this way. 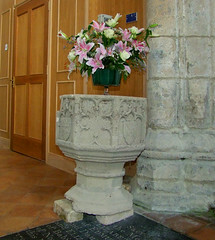 Coming back in 2016 it was to find that the church is now open every day to pilgrims and strangers, and in any case the north aisle is now converted into a kitchen area with tables and chairs. Instead, you enter through the north door, and the first view is across the white light of the nave, and then, turning to the east, into the almost impenetrable gloom of the chancel. 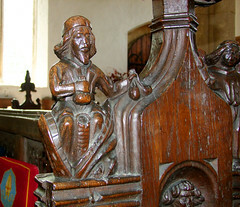 The Wiggenhalls are synonymous with some of the best late medieval woodwork in England. 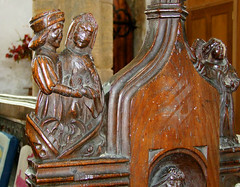 Across the Ouse at St Mary, there is range after range of benches of the highest quality, but being a redundant church in the care of the Churches Conservation Trust it feels rather museum-like. St Germain is quite different. 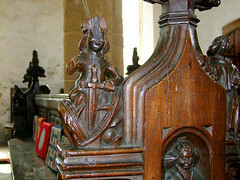 Here, the carvings are quirky and full of life, which suggests that despite the proximity they are by a different hand. 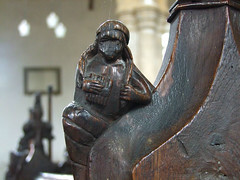 In the medieval merchant ports of the Ouse delta, it is quite likely that services like carving were bought in from outside, so what we have here are probably two neighbouring parishes competing to outdo each other. 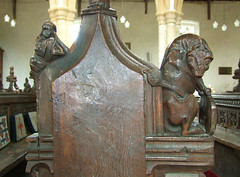 The medieval benches form the two central ranges in the nave. Most of those in the aisles are Victorian copies, but good ones. The main bench ends face into the central walkway. 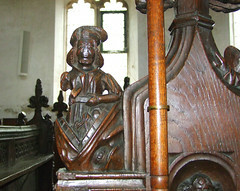 As at St Mary, they consist of a large figure in a niche, two smaller figures or scenes on either side above, and the whole lot surmounted by an elegant poppyhead. On the south side, the upper subject is the Seven Deadly Sins. 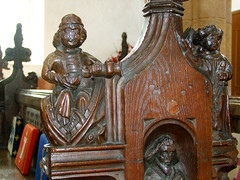 The sin is depicted on the left hand side, with an angel on the right hand side indicating the sin. Each sin scene is set in the mouth of a big fish representing the jaws of hell. 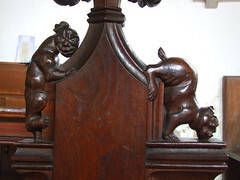 The surviving scenes, from the west, are Lust, Gluttony, Avarice, Anger and Pride. Sloth and Envy are destroyed, although one survives as a stump. Pride is damaged, but the others are in wonderful condition. 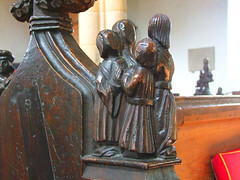 The figures in the niches are Apostles. On the north side are incomplete parts of several sets. 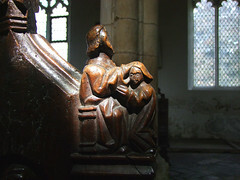 The seated figures are probably the Evangelists. 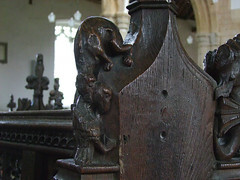 There is also a small selection of carved animals, most of which are quiet, local images of everyday creatures, although there is a super pig-like dragon. But most important of all there are the seven sacraments of the Catholic Church. The Sins and the Sacraments were popular subjects in the 14th and 15th centuries, at a time when the Church was trying to reinforce Catholic orthodoxy in the face of local superstitions and abuses. The imperative for this had been the rising to prominence of a new middle-class after the old estates had been broken up in the wake of the Black Death. They were most concerned that their souls should be prayed for, especially in the event of a sudden death. 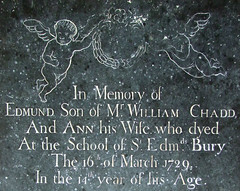 Their bequests that made their mark on the imaginations of their parishes transformed the churches of eastern England. In time, this need for control would lead to an embracing of the new big idea beginning to take shape on the continent - protestantism. But that was still in the future. 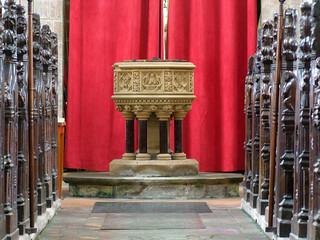 There are two fonts; a rather robust 19th century stone one on marble pillars, and its medieval predecessor relegated to the floor in the south aisle. 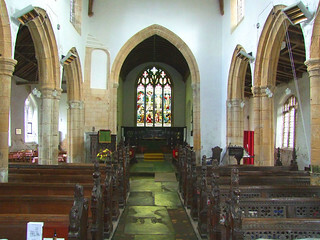 The north chancel aisle is pleasingly free of clutter, allowing that white Fenland light to spill across it in almost a Dutch way. 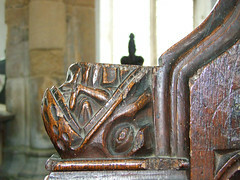 The rood stair turns inside the chancel arch, and again is pleasingly shabby. 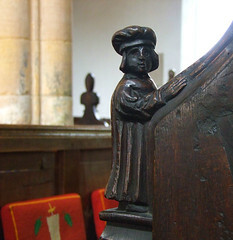 The Jacobean pulpit still has its hourglass stand, and a couple of evangelical banners add a touch of colour. I started this account by commenting on the gloom of the chancel, but I should say that there is a dark richness here, fully Victorian with coloured wrought-iron altar rails and heavy wood panelling. I'm glad the whole church isn't like this, but it provides an interesting contrast with the medieval glories of the nave. St Germain was Bishop of Paris, and this is the only church in East Anglia that has him as its dedication. It is fitting that it should be such a special place.